This next bit of comics news is AWESOME, in so many ways. 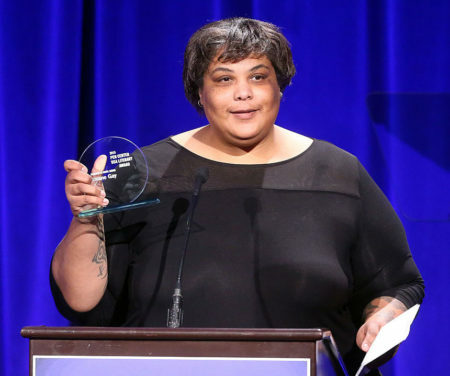 Feminist writer Roxane Gay (author of the books Bad Feminist and An Untamed State) is about to join the ranks of Marvel Comics authors with an exciting roster of new female characters. The new series is going to be called World of Wakanda, a spin-off of the Black Panther series written by Ta-Nehisi Coates (he’s also a correspondent for The Atlantic). Roxane, along with poet Yona Harvey and Ta-Nehisi, will pen the new series, which stars two queer women named Ayo and Aneka that are former members of the Black Panther’s female security division, called the Dora Milage. The first book also contains a 10-page story written by Yona about Zenzi, a riot-causing revolutionary that appeared in the first Black Panther comic. The announcement of the new series comes at a pivotal time, as Marvel has been under A LOT of heat for its lack of diversity in its writing positions. Many have pointed to the 15-year-old black female character Riri Williams in Iron Man — a comic that is penned by a white man, Brian Michael Bendis — and asking Marvel to hire black women to write these stories. Thankfully, Ta-Nehisi, who recruited Roxane for the World of Wakanda project, is on course to do that. This new Black Panther series is sure to shake things up — we can’t wait to see what Roxane does with Wakanda!